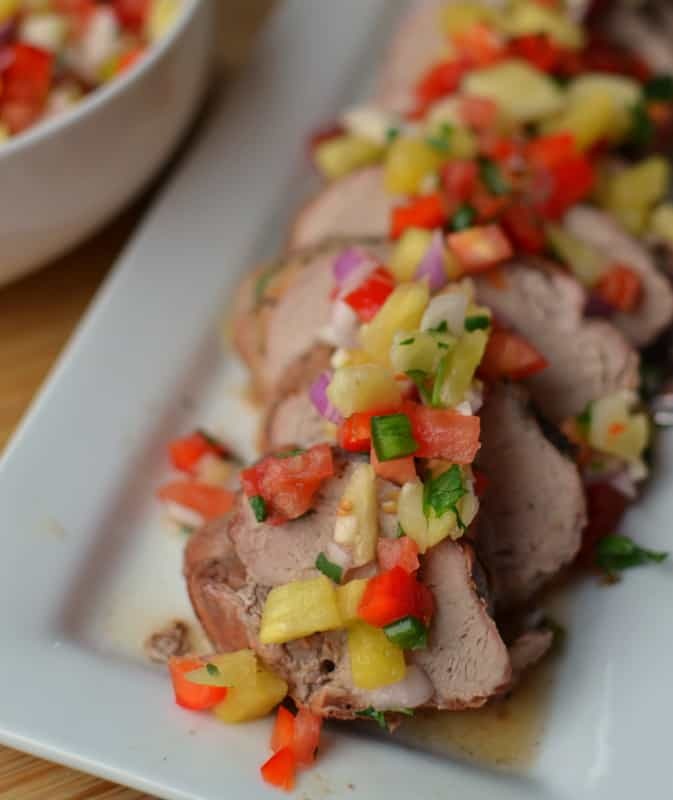 This Grilled Pork Tenderloin with Fresh Pineapple Salsa is a light, fresh, colorful, healthy family favorite ready in around thirty minutes making it perfect for any weeknight!! 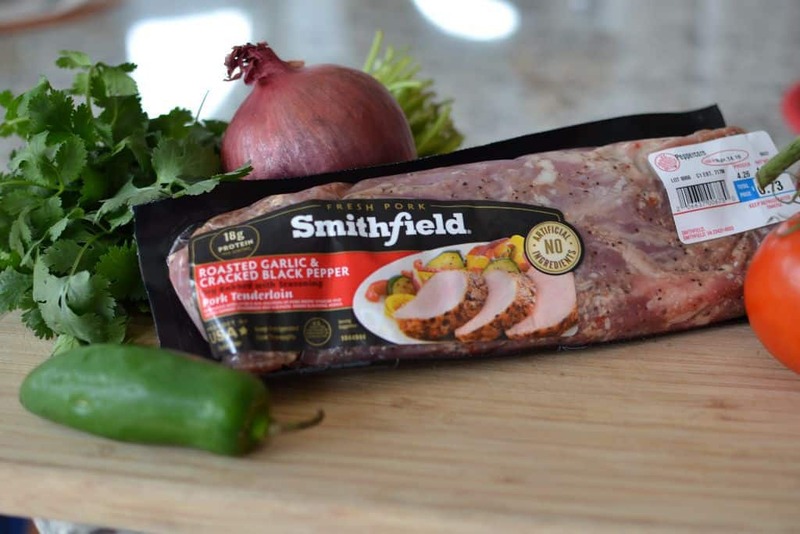 Smithfield® Marinated Fresh Pork is a favorite in our house. 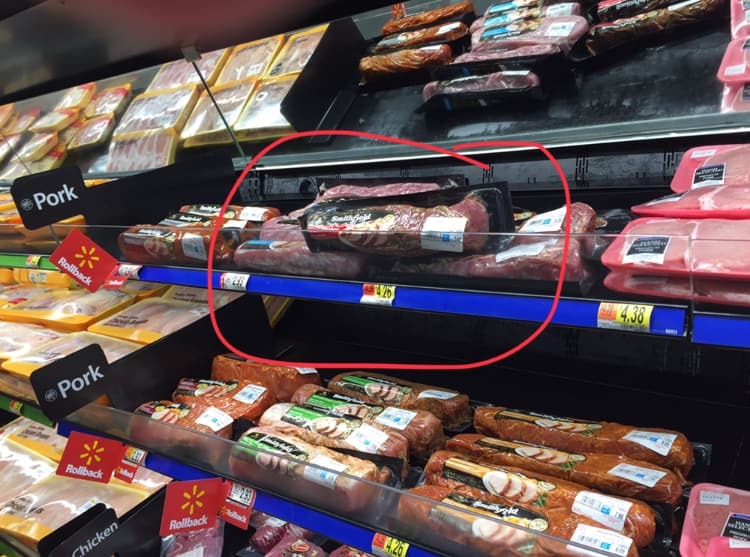 They are always perfectly marinated, seasoned and oh so tender. Spring is on its ways so it is time to fire up that grill. 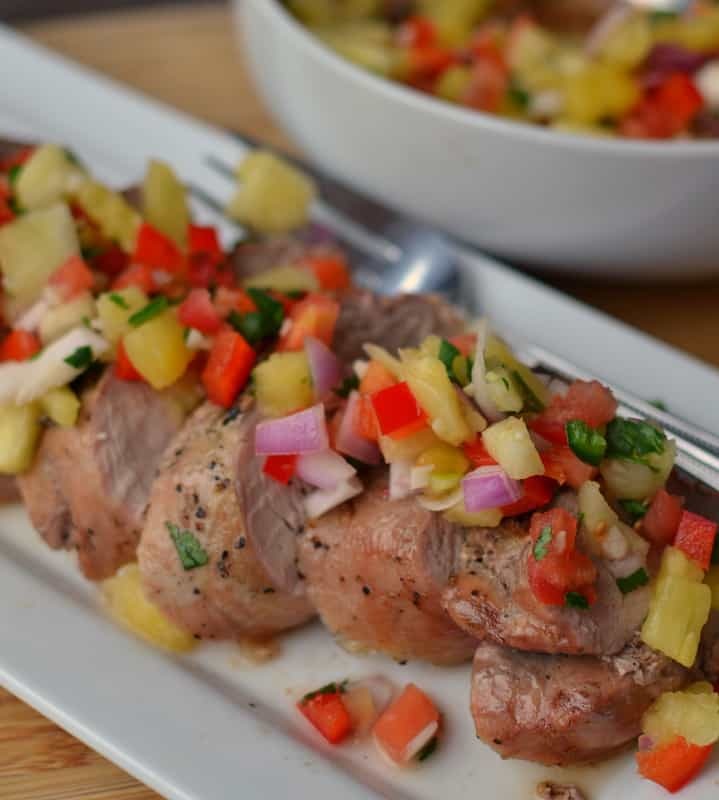 This Grilled Pork Tenderloin with Fresh Pineapple Salsa is so delectable and the colorful presentation makes it a picture perfect spring and summer meal. It is pretty enough for company yet easy enough for a weeknight meal. It is ready in around thirty minutes leaving you plenty of time for all of the other season’s activities. Smithfield Roasted Garlic & Cracked Black Pepper Fresh Pork Tenderloin tastes amazing and cooks up just perfectly. I grilled this for about thirty minutes while I prepared the pineapple salsa. I let it rest for a few minutes before slicing. The tenderloin was so easy to cut. My knife slide through it like butter. Smithfield® Marinated Fresh Pork is one hundred percent fresh pork made with real all natural ingredients. They are delicious roasted, sauteed and grilled. I love to cut them in chunks and thread them on bamboo skewers with some peppers and onions. They cook up quick and taste oh so good. 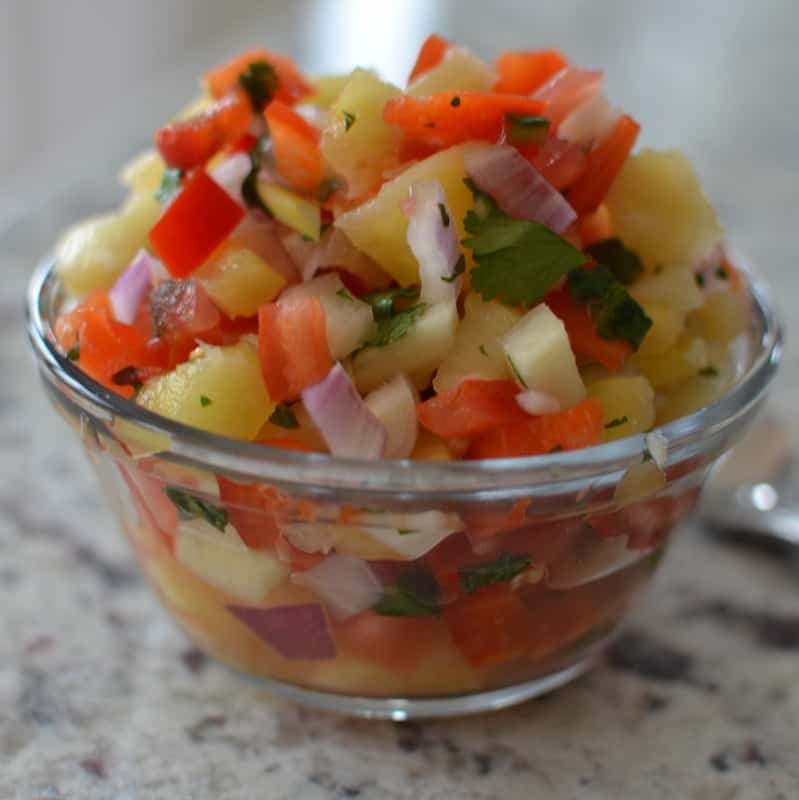 This delicious pineapple salsa can be prepared in just a few minutes, is loaded with good for you fruits and vegetables and adds color to almost any dish. It really complements all the great flavors in the Smithfield Roasted Garlic & Cracked Black Pepper Fresh Pork Tenderloin. Just look at all that gorgeous amazing color in the pineapple salsa! Now imagine it on fresh grilled pork tenderloin. Mouthwatering goodness in every bite. Smithfield® Marinated Fresh Pork is available at your neighborhood Walmart and is on rollback through April 24, 2018. Visit Smithfield® to find lots of amazing ideas for cooking Smithfield® Marinated Fresh Pork. Grill one up today and and serve it with my Fresh Pineapple Salsa!! Your loved ones will be singing your praises! In bowl combine pineapple, tomato, onion, cilantro, jalapeno, garlic, cumin and salt. Stir several times while grilling to get the flavors to meld together. Preheat grill to 400 degrees. 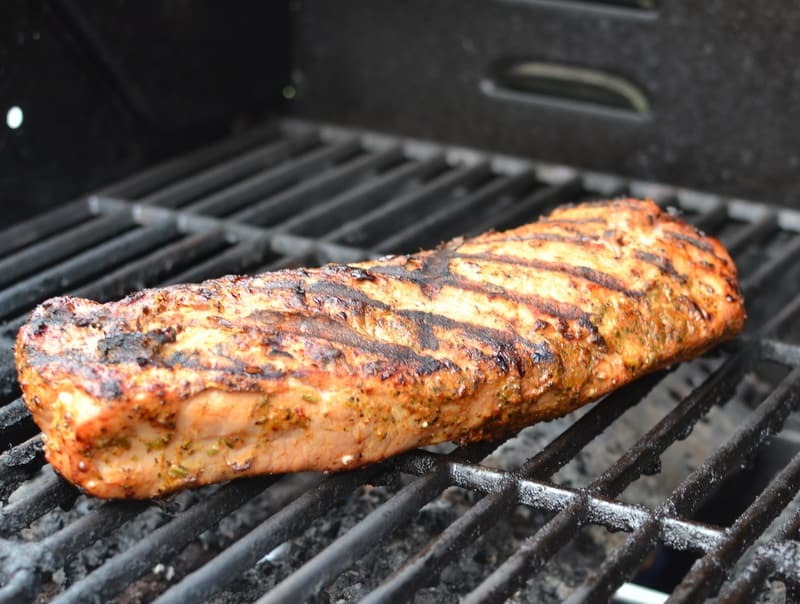 Grill pork tenderloin until golden brown and cooked through; about 30 minutes. Turn several times. Remove from grill, cover loosely with foil and allow to rest for 10 minutes. Slice pork tenderloin and serve with pineapple salsa. When storing leftovers separate the salsa from the pork tenderloin so the acids in the pineapple do not affect the texture of the pork tenderloin.